New investment in the Premiership will make the league "bigger and better", says clubs' chief Mark McCafferty. 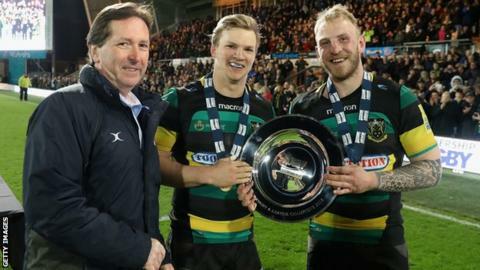 The Premiership clubs are considering an approach from financial giants CVC, one of "several" options on the table. The offer is worth £275m for about a 50% share, although McCafferty has valued the league at "substantially more" than £550m. "There is agreement the club game is in significant growth, and there is an opportunity to accelerate it," he said. However he stressed "we cannot confirm or deny any interest by any party in the financing options being considered". McCafferty says the league has grown at a rate of 80% in the past five years, and is bringing in revenues of around £70m per annum. "We've been in a very strong growth phase, we think we can do more both domestically and internationally, and we want to find the best way of achieving that," he told BBC Radio 5 live. The club owners will hold a board meeting on Tuesday to consider their next step, with McCafferty insisting any decision will be "for the good of the game" in England. With figures such as Bath owner Bruce Craig opposed to a takeover, it is likely at this stage the clubs will reject CVC's offer, although McCafferty says there will be change coming in some form. "Whatever we decide to do, the kind of people involved in our clubs - the shareholders who have seen this game through from professionalism - they are very conscious about doing things the right way," he said. "They are very good custodians, and they have no intention to do this in any other way than what's good for the game and good for the clubs. "It's about trying to accelerate this next phase of growth, because this competition can be even bigger and better than it already is." Premiership clubs have struggled financially of late, with every organisation bar Exeter Chiefs losing money year on year. However, McCafferty believes the 8% share each club has in the league compensates for this, and believes the losses are not the sole factor behind the move for extra investment. "It is not the only driving force by any means," he said. "It is more about how can we use that value that sits in Premiership Rugby to try to accelerate our development. "If those clubs become stronger, watched by more fans, in better facilities, then the Premiership becomes stronger and you get a virtuous circle." McCafferty has also moved to allay fears that extra investment in the club game will affect relations with the Rugby Football Union. The inception of the Premier League and the growth of club football in the 1990s has impacted on the primacy of the international game - something McCafferty hopes to avoid. "Every one of our owners wants to see England winning, and I hope the RFU wants to see the clubs successful, as they feed off each other," McCafferty said. "I am sure the RFU will be supportive, and everyone - first and foremost our shareholders - will want to make sure that whatever we do, we do it in the right way for club supporters and for England."